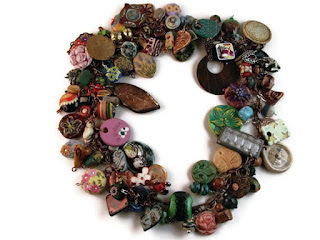 Baublicious: The Art Bead Love Tour is Headed for Seattle! Found out over the weekend that I'm going to be the next stop in this fabulous tour! I can't tell you how excited I am! I've watched the tour's progress from blog to blog and now I'll finally get to see all these lovelies in person. Definitely happy dance time. I've already started going through my collection, trying to decide what I'll add to the mix. As for what I'll claim from the chain; I'll decide that once I see it in person. And then, after a short stop in Seattle, it will be off again to its next US destination. "The Art Bead Love Tour is an ongoing project to spread the love of handmade to new and exciting places. It's a way to reach people who may have never stumbled upon your blog on their own, and give them a chance to share the love of handmade. A chain was chosen to link beads as a symbol of how this project links us all together~in our unity to stand behind handmade." So stay tuned for future posts and your chance to win a stop on the hottest tour of the season! I've been following this too. Waiting, and hoping at a chance to participate. I'll be watching your blog for entry details!